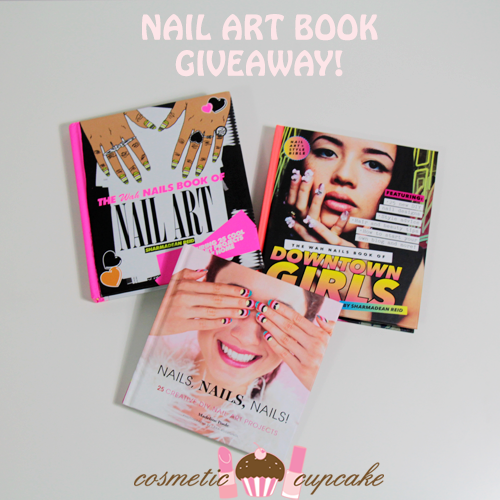 Cosmetic Cupcake: Belated 4th blogiversary giveaway week 3: Nail art book giveaway! Belated 4th blogiversary giveaway week 3: Nail art book giveaway! Winner will be announced shortlyHappy Monday and welcome to week 3 of my belated 4th blogiversary giveaway!! This week I am giving away 3 of my favourite nail art books from nail artists I admire - Sharmadean Reid of WAH Nails and Madeline Poole. These books are chock full of step by step nail art tutorials so you can create their awesome designs yourself at home. When I try the designs out at home they don't look anything as precise and neat as theirs do but hey it's all about trying right!! - once the winner responds, I'll be ordering the prize from the Book Depository to be sent directly to the winner. I hope you've enjoyed the giveaways so far! GOOD LUCK! Thanks so much lovely!! Can't believe I'm still doing it after so long lol. YES please next time you come to Sydney I have to do your nails!! Congrats! My favorite nail art trend at the moment is the dry-brush "distressed" technique. Thank you for having the giveaway! Congratulations on the anniversary and thanks for the giveaway! My favourite current nail trend at the moment is definitely negative space or clear nail backgrounds with nail art on top! Best!! Well I'm new to this nail art stuff so a bit of a rookie but I'm really intrigued by the water marble nail at trend (which I haven't quiet mastered yet) Will keep trying until I get it right! I love glitter toppers over a gradient, like a strip of glitter down the center of the nail. Or a scaled gradient..basically all versions of a gradient! Lol my rafflecopter name is Ashley Nicks. Thanx! Right now I am loving polka dots! I think they are so cute to wear in the summer. Not sure about trends but I love glitter, especially with gradients! I love clashing colours!! I don't know if that's a trend though haha. and congratulations on your 4th year of this blog!!! Congrats! Gradients are always nice but even nicer is watermarbles. I am really loving all the galaxy nails! I tried them and they are way easier than expected, so yay! Love gradients! Wish I was better at it though! really loving all the galaxy nails!